Welcome to Milnathort Primary School. 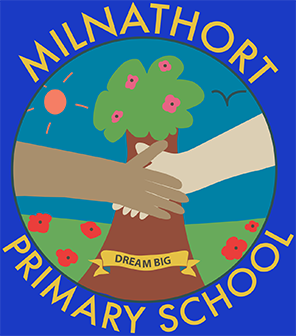 Our overall aim is that all the children who come to Milnathort Primary will feel safe and happy in school and know that their opinions, ideas and efforts are valued. Our core business is learning – and we seek to provide enjoyable, creative, relevant, challenging learning activities for our pupils. We seek to ensure that every child works to the best of his/her ability, is polite and caring towards others and feels good about him/herself. Overall, we want our pupils to have ambition, to believe in themselves, to aspire to be the best they can be. Parents are always very welcome to come and meet the Head Teacher or Depute Head to discuss their child’s education and wellbeing and to offer any help and support.